From drifting pastoral reveries to dense, open-tuned experimentalism, from patient expositive ambient passages to thundering verses, the dazzling feat of In Sequence is that it succeeds at being all indie rock things to all indie rock people. Even with a spirited experimental bent shot through the entire collection, Burning Alms' melodies, textures and dynamics on its debut long-player are fiercely engaging. This is no great surprise: Burning Alms principals John Biggs and Thomas Whitfield have made compelling music together for more than a decade, and few bands releasing debuts build from such a formidable foundation. Which is another reason why In Sequence is a terrific whole-album experience, one that is cinematic, mysterious and thrilling (and often all three in one song, such as the Branca-styled tour de force "Night Climates"). Long-time fans of the pair's music will find the collection wholly satisfying, and new fans -- whose sentiments are uncolored by the estimable back catalogs underpinning the new set -- will likely wonder where the hell these guys came from all of a sudden. And we suppose that is the optimist's edge of the double-edged sword of being massively underrated: the more one toils away from the sucking white-hot static of the hype-cycle, the more likely one is able to blow away listeners when one comes around with the goods. It has been a long road for Mssrs. Biggs and Whitfield, from early days in legendary Birmingham post-punk act Distophia to, more recently, the ludicrously slept-on Calories. That In Sequence is the duo's best shot at breaking through (at least since Northern Ireland/London-based Smalltown America released Calories' titanic debut Adventuring) is perhaps bittersweet, because as captivating and strong as this new record is, it is not so foreign from the recent work of Calories, not unrecognizably descended from Distophia. It has been a bit of a parlour game here at Clicky Clicky HQ, figuring out what is going on with all of the various Distophia-descended bands, and what distinguishes them, particularly given the fact that certain of the bands have, at least at times, contained the very same members while performing under different names. Of that cohort, Burning Alms' music is dustier, more meditative, addresses more abstract lyrical themes, and only occasionally shimmers in the way of certain Calories songs (such as the epic closer to Calories III, "Tropics"). We suppose Burning Alms must be defined by the absence of the songwriting contributions of Calories bassist Pete Dixon, who keeps busy with Sunshine Frisbee Laserbeam and recently played his first solo show in seven years, but how that absence manifests itself sonically is unclear. Perhaps one characteristic attribute is Burning Alms' aforementioned meditative dimension, apparently inspired by Mr. Biggs' interest in American literature and existential thinkers, although such conjecture is almost immediately dispelled by the crushing 5/4 opening of the blistering "The Aperture Colonised," the high-octane whirl of the single "Matadors," or the shuddering rage of "Forest Clearing." 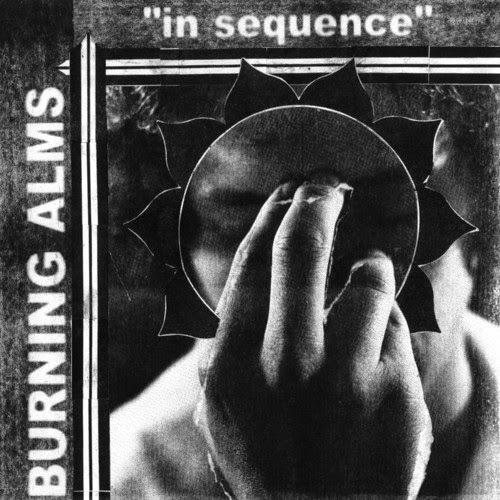 Perhaps in the music of Burning Alms there is a more restless pursuit of experimentation, as in the free-form title track to In Sequence, a minimalist pastiche of ambient (amp?) noise, taped voice interaction and skeletal guitar noodling. Whatsoever its determinant je ne sais quoi, no listener will come away from listening to In Sequence feeling like something is missing. Indeed, what ultimately makes Burning Alms' debut such a resounding success is its ability to balance myriad sounds and styles in such a way as to evoke a singularly rich musical identity. Smalltown America released In Sequence Monday. The set is available as a vinyl LP, compact disc and digital download, all of which can be purchased through the label right here. Stream the entire record via the Spotify embed below.